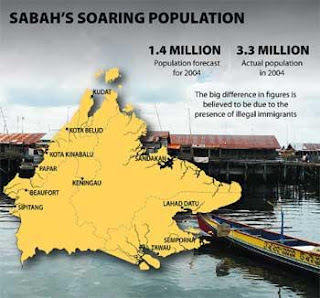 Kota Kinabalu: Sabah has recorded an "extra ordinary" increase in its population over the last 35 years and it could be due to the illegal entry of foreigners into the State. In disclosing this, the member of Human Rights Commission of Malaysia (Suhakam) Prof Datuk Mohd Hamdan Adnan said the latest statistics showed that the population in Sabah had increased more than four folds from about 697,900 in 1970 to almost three million in 2004. In comparison, neighbouring Sarawak's total population grew from around one million to 2.3 million over the same period, he said. "This is quite puzzling and of course, the citizens of Malaysia, especially the people of Sabah, have the right to know the contributing factors of this extra ordinary increase," he said, Friday. "Our borders (Sabah) are porous and they (illegal immigrants) can easily sneak in even after they had been sent back to their home countries. "Based on feedback, some of the detainees at the temporary detention centres in Sabah, once they are sent back, they try to come back to the State under different names," he said. On delayed deportations of detainees at the temporary detention centres particularly in Sandakan and Tawau, Hamdan said the problem cropped up because some of the detainees did not possess proper travel documents. As such, he suggested "the country which had a large number of detainees" to set up an office in Sabah to facilitate the issuance of valid travel document. He said more than 50 per cent of the detainees in temporary detention centres throughout the State were Filipinos. Meanwhile, Suhakam has asked the Federal Government to solve the overcrowding at the prisons in Sandakan and Tawau. Meanwhile the Consumer Association of Sabah (Cash) proposed the setting up of an Independent Commission to investigate Sabah's "big" population. Its President Datuk Patrick Sindu said if the claims are true, the Commission must find out how so many of the foreigners could own the Mykad. "The source of the problem should be identified and solved as we don't want this State to end up like Palestine where at the end of the day its citizens had to squat on their own land," he said.